The skills, people power, systems, machineries and resources available for shipbuilding are deployed for repairing and refitting. With the same commitment to quality and timely delivery. Along with traditional general engineering activities and manufacture of ancillaries, the new focus at SIPL is on precision work. State of the art infrastructure permits SIPL to undertake demanding fabrication jobs for submarines. 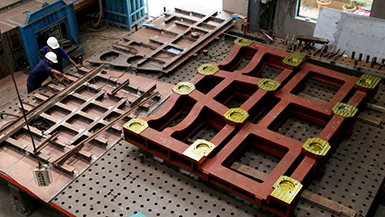 Three normal MS skids of generous sizes, 20m x 5.5m (1 no), 10m x 4m (2nos) and one special cast iron skid 7m x 7m are used for high precision fabrication jobs. 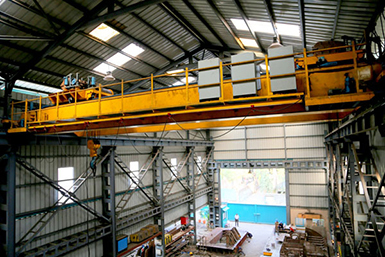 An EOT crane 25t/7.5t (auxiliary) with 13m span and 10m lift, covering the entire length of the workshop, facilitates easy handling. 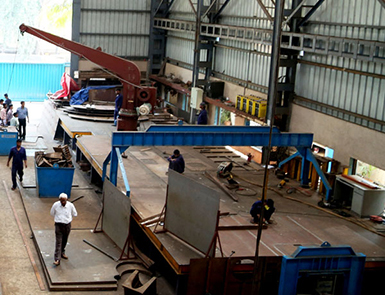 The workshop is well equipped with normal range of machinery such as lathes, drills, grinders, welding/cutting equipment (including Plasma Cutting, Mig/MAG Arc welding machines), baking ovens, weighing and calibrating machines (including a Total Station for very low tolerance jobs), theodolite, hydraulic jacks and full range of tools and tackles. 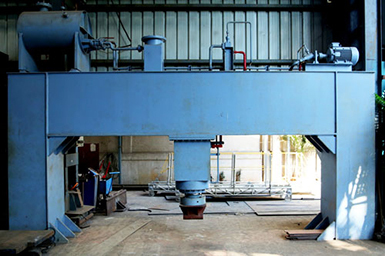 Of special note are three hydraulic presses with capacities/sizes ranging from 100 MT X 1.7 M Span, 100 MT X 5.5 M Span to 250 MT X 4.7 M Span. The original, much smaller workshop, equipped with 5 lathes, 2 radial drilling machines, hydraulic hacksaw, two core cutters, boring machine, three grinding machines and a host of other portable tools and machines, ably supports the ever expanding activities of SIPL. The new workshop of SIPL has a spanking new 4 storey office building which it shares with Shoft Shipyard for use of admin, engineering. HR and accounts personnel of both units.